How to Improve Your Credit Score 110 Points in 6 Months! Credit score got you down? Don’t fret! Help is around the corner to improve that credit score! Maybe your credit score has been an out-of-sight-out-of-mind thing… this article will take you through why you should be aware of your credit score, why it matters, and also how to improve it pretty quickly. Though credit scores aren’t always an indicator of financial health, they are used in a variety of ways that have a major impact on your life. Interest rates are almost always determined by credit scores, while insurance carriers often take your score into consideration for premium rates. You may even be disqualified for certain jobs if you have bad credit. So, if your score stinks, it could be costing you thousands. Luckily, you don’t have to live with bad credit forever. There are plenty of things you can do to improve your credit score fast. 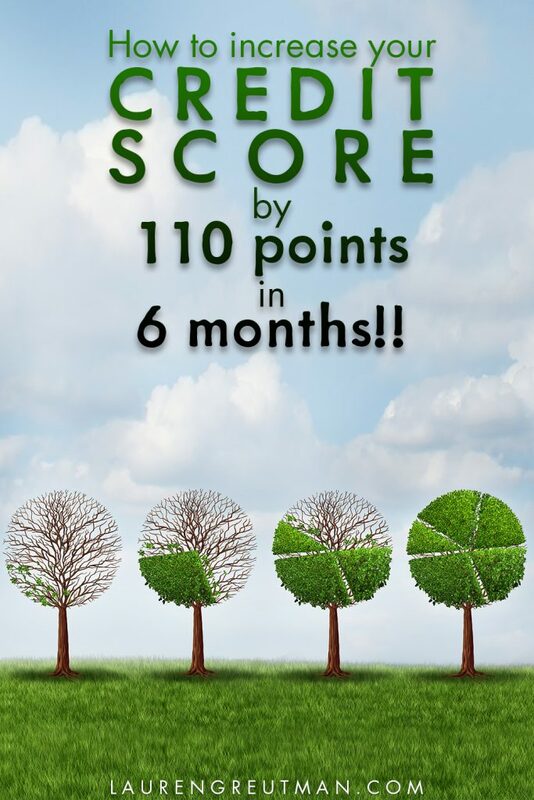 Start using the tips below, and you might see your score improve by as much as 110 points in 6 months! If that sounds good to you, let’s get started. The first step to improving your credit score is know where you currently stand. Makes sense, right? Lucky for you, there are plenty of free and easy ways to do it. Credit Sesame is a great resource for free credit scores. Just sign up for free – that’s FREE with two “E’s” – to get your credit score right away. The free version also provides updates whenever things change, so you can monitor your score as it improves. Sign up for Credit Sesame for free HERE. It’s worth noting that this score is based on your TransUnion credit report and acts as more of an estimate than a true credit score. For a fee, Credit Sesame will monitor your reports from all three credit bureaus. However, in my experience, Credit Sesame’s free score has been pretty darn close. To get the score that most lenders actually use, you’ll need to sign up for a paid account through MyFICO.com. But keep in mind that this will give you your credit report, but not your score (which is why I also recommend Credit Sesame above). Since you’re trying to improve your credit score fast, I’d recommend grabbing all three at once. Comb through the reports and search for any errors. If you find some, file a dispute to correct it immediately. Also, make sure to look for past-due accounts. Then, negotiate a settlement that removes them from your credit report. After your initial credit report check, you can begin the next year by monitoring one credit report every four months. That way you can keep an eye on your credit reports throughout the year…and you can do it all for free! Here’s the deal: Making late payments is a great way to destroy your credit score because your payment history makes up 35% of the score. If you’re habitually late, it’s going to send your credit score into the toilet. Even one late payment can have a significant impact. To fix this problem, the first thing you should do is get current on your bills. Find out how much you owe, and get your payments up to speed. If you’ve only missed one payment, call up your creditor, explain the situation, and ask them not to report it to the credit bureaus. Pay that sucker off, and butter them up with compliments if you think it will help. If you’re way behind, try and negotiate a way to get current. Then, stick to the agreement and pay them off. Just make sure to get it all in writing first! Now that you’ve clawed your way back to current, you’ve got to pay your bills on time. Do whatever it takes to make sure you get that money in by the due date. Set up autopay, try payment reminders, post a giant sign on your bathroom mirror – I don’t care! You've just got to pay on time! Seriously, it’s that important. Nothing else will help you build your credit score faster. Pay. On. Time. The second most important piece of your credit score is called “credit utilization,” accounting for a whopping 30% of the total. 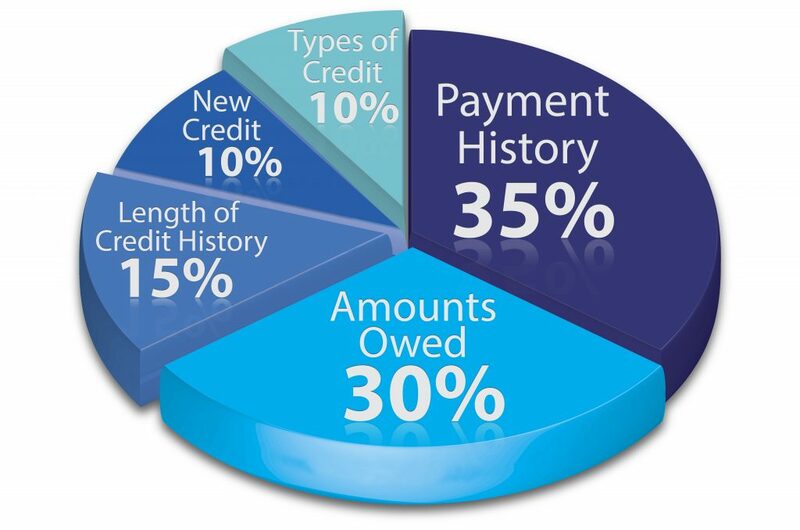 Essentially this is a ratio of the amount of credit you are using compared to the amount that you have available. The higher your credit utilization, the lower your score. There are two ways to decrease your credit utilization. The most effective way is to reduce the amount of debt you owe. 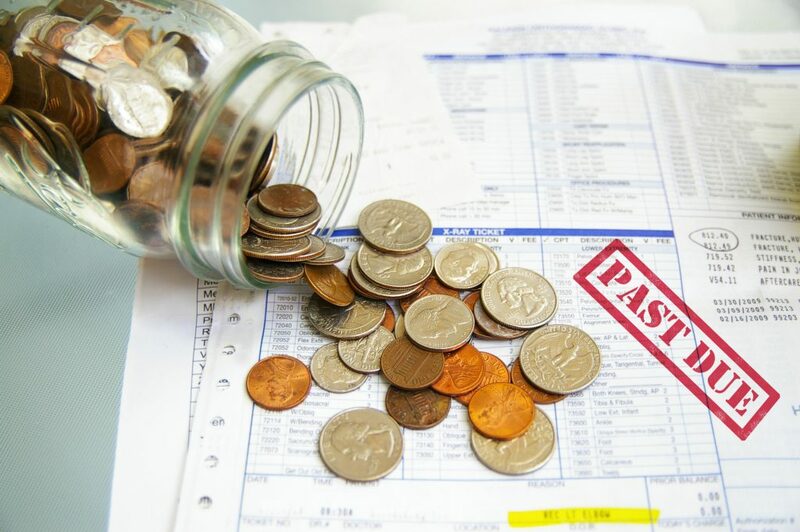 In addition to paying on time, pay off your debts as quickly as possible to improve your utilization. The other way to improve your utilization is to keep lines of credit open. So, once you pay off that credit card, don’t close it immediately. Having unused open credit will help both the utilization and credit history components of your score. Personally, I don't like having many open lines of credit and when we were getting out of debt, we just closed them all. And if you have a spending problem, that might be the best course of action for you too. But if you have it under control, it's not a bad idea to have one or 2 open. Personally, we have 2 credit cards open – one for personal and one for business. You might think your credit score is a measure of your financial health. That’s not quite true. A credit score is actually a measurement of how well you handle debt. So, the only way to build a credit score is to use credit – and use it responsibly. Sign up for a credit card. Pick one bill, like your cell phone bill, and schedule automatic payments for this bill on the credit card. Set up automatic monthly payments in full for the credit card using your regular checking account. This way, your credit card will be used, but you won't actually be “using” it… if that makes sense. If you’ve had a history of credit problems, you may need to start with a secured card that has a small limit. Regardless of the type of card you choose, use it sparingly and pay it off every month. The method above will help. Unfortunately, credit scores don’t change overnight. Improving your credit score takes time. However, if you get started using the tips above, you’ll start seeing an improvement fairly quickly. By doing the right things, you should notice your score creeping up within a month or two. And if you started with a poor score and made drastic improvements, an increase of 110 points within 6 months is totally possibly. Most importantly, remember to use your credit wisely. Avoid debt whenever possible, pay your bills on time, and pay off your credit cards every month. Doing that has more than just a positive effect on your credit score; it puts you in a great position to make the most of the money you already have. Remember, the ultimate goal is to improve financial health… it's just that improving your credit score almost always has the byproduct of improving overall financial health in the process. Greg Johnson is a writer and entrepreneur who leveraged his online business to quit his 9-5 job, spend more time with his family, and travel the world. 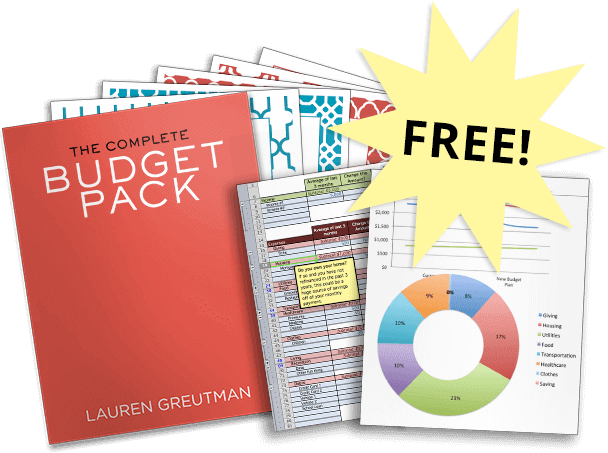 As a money nerd, he enjoys writing about topics like budgeting, frugality, and investing. With his wife Holly, Greg co-owns two websites – Club Thrifty and Travel Blue Book. Find him on Pinterest and Twitter @ClubThrifty. I couldn’t believe how they helped me increase my score. Thanks for the referal. I was in a terrible situation sometimes last year. We urgently needed to get a new house, my credit score and my wife own too was bad. We tried all we could to get a loan but all effort was in vain due to the bad credit score.An lawyer I contacted to help dispute our collections requested for $1000 upfront, the major credit repair companies gave a year estimate to get us to where we need to be, God so good to us, I later met with a credit score specialist and instructor, he gave me some instructions and requested some information from me regarding my credit score in which I provided everything to him. Luckily for me, this man was able to fix my credit score, I was so amazed because he completely removed all my inquires, collections and late payments, I’m happy to tell you that I’m writing this review from our new house which I wouldn’t have got without the specialist’s help. I know some people out there are in this kind of situation and I would love to help to put specialist’s contact here, You can message him privately on his mail which is hackwiz at protonmail dot com if you like, this help cam at a time I already lost all hope.you can tank me later. Hi, I’m confused. Can you help me get hard inquiries and late payments off my credit report? I just had a past due collections appear on my credit report from 5 years ago. I knew nothing about it. I called the credit collections company and paid the debt. I I called the collections company and they said “no” that’s up to credit bureau. I just called Transunion again and they said it was no longer on report. Experian won’t answer their phone so went online, all effort to correct this was proven abortive and i need to do this fast for me to qualify for a house mortgage. Few weeks ago I came across this credit coach who many had recommended how he had helped them with their credit score. I contact him via his gmail (cyberhack005@gmailcom) and asked if he could help me. He answer boldly ‘YES’ and explain to me in details the whole process. I give him a try to my greatest surprise he did an amazing job. My score has boost to maximum and all 3 items were removed.